Charge of the Metro brigade: Did Microsoft execs plan to take a hit? The strategic thinking goes like this: Microsoft needs brute force to coerce a touch-based "ecosystem" into existence, and it's using Windows as the battering ram. Microsoft fears that if it loses "touch" to the iPad and iPhone and Android, then it loses its place in the consumer space altogether. These tablets are increasingly capable of content creation, it notes. And because of this, Microsoft is going to force-feed Windows 8 to millions of PC users on non-touch devices, for whom Metro is nothing but a hindrance, in the hope that the market provides content and applications "designed for Metro". All this has consequences, though. One analyst tweeted that Windows 8 will give a big benefit to Windows Phone – which must be music to Microsoft's ears, for WP is currently in the doldrums and needs a lift. But this reflects the theory rather than the reality. I see it working both ways. Users who have a bad time on Windows 8 aren't going to take a closer look at Windows Phone. The desktop experience may then act as a weird kind of aversion therapy. If Metro 8 is not decoupled from the central non-touch Windows UX, then enterprises will simply shun the upgrade. They don't have the budgets to retrain their staff. In the days when you were moving thousands of people from DOS to Windows, you could argue for a bigger training budget. 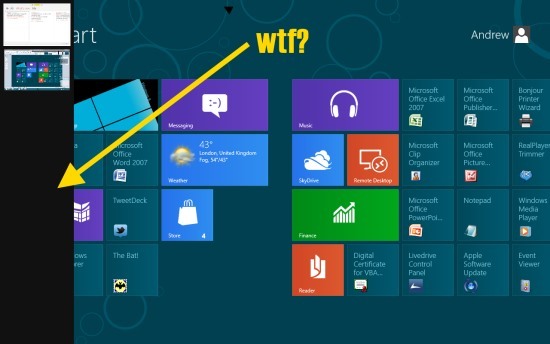 But the cost/benefit advantage just isn't there in Windows 8. Microsoft doesn't have the power to move its market in the way Apple can – the market would prefer to shun the upgrade, as it did with Vista. "Inside Microsoft, there is a related fixation on whether Windows 8 will succeed and, yes, there is a contingent of people stuck in a paradoxical position: They understand that the success of Microsoft is inexorably linked to Windows, and thus that Windows 8 must succeed. But they desperately want Steven Sinofsky, and thus Windows 8, to fail. That both can't happen is of course the unresolvable issue," he writes. This is all quite puzzling. We must assume the Metro-centric core of Microsoft executives is thinking rationally. We must assume they have done some maths. Which means Microsoft is at least prepared to forgo the revenue that comes from one enterprise Windows upgrade cycle, just to jam Metro into the public consciousness in the long term. Perhaps Microsoft has justified this with the thought that the mere $4.74bn in quarterly revenues that the Windows division brings in is fairly inelastic – it won't vary much whether Windows is a hit or a flop - and that OEMs have to keep building and buying PCs. So it must have also reckoned that it can afford to take a hit in the short term to preserve Microsoft's relevance in the long term. Perhaps this isn't so crazy. Microsoft's Entertainment division (led by Xbox) now makes almost as much money as Windows. This, then, appears to be Microsoft's gamble. I just wonder if it has revealed all this to the shareholders? Perhaps it should.